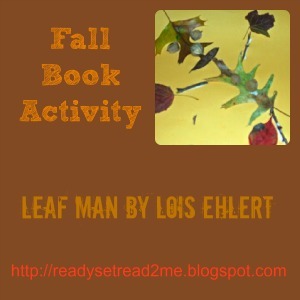 Leaf Man by Lois Ehlert is one of my favorite fall books. In this story, Ehlert creates leaf collages of people, chickens, fish, turkeys, butterflies, geese, and more. She uses her collage art to beautifully weave a story of a leaf man, who travels where the wind blows. She encourages young readers to stop and look for leaf man-- and to enjoy the beauty of fall leaves. After reading leaf man, Logan and Tyson and I went on a nature walk. 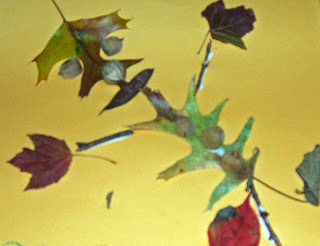 We picked up many fall items and brought them home to create our own leaf man collage. I did a lot of modeling on this craft but older kids would have fun creating many of the animals or their own kinds of animals. I'm sure my nephews (ages 5 &6) would use their leaves to create dinosaurs! As we made our collages we talked about eyes, ears, nose, mouth and where those things belong on our face. We pointed to them to show Tyson (our 8 month old). This was a good way to get him involved too. Do you take nature walks with your kids in the fall? Try making a leaf man of your own. My son does this kind of stuff all of the time. He finds items around the yard and starts creating. Children have no boundaries when it comes to their creativity. This book is great! I was just telling people at my blog that they had to see your art. It's awesome! I love children's books too. I have not read this one yet. What a great book and art project to celebrate fall. I'll check for Leaf Man at the library. If I can't find it, I'll order from your Amazon link. I use Amazon Affiliate on my blog too. I love this book, but I couldn't find it when we were doing our leaf projects. Their leaf men came out cute! If you stop by to see our stART project, then please check out the interview I did with Leah of Almost Unschoolers as well! We just read this book and loved it. It is funny while kids are making their own leaf men Selena related more with how our leaves always blow away in the winds that we get here. So cute! I noticed you just became a follower of my blog (little learners lounge) and now I'm following you too. I also taught Reading Recovery! We're going to have to get this at the library next time! Love that art work. We just collected some leaves so now you've given us another project to do with them. Thanks for sharing! It's one of our favorite books here too - I liked how your leaf man turned out. Thanks for sharing with us at the Play Academy! I love your leaf person's face! What a great craft idea!